From sewing to card making, creations are always in the works in our home. One of my favorite past times is sewing. No matter how frequently the seam ripper is in my hands, I find sewing to be relaxing and enjoyable. 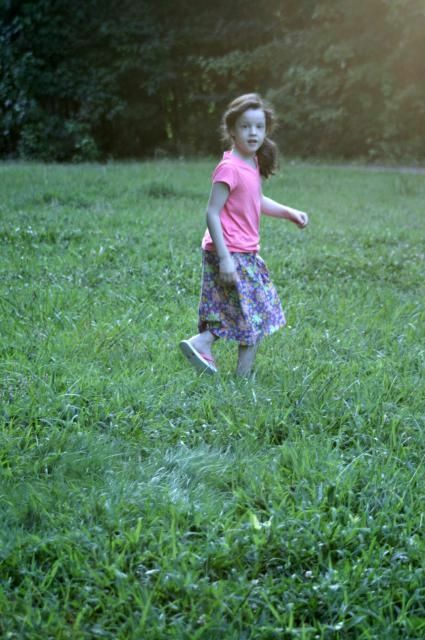 My daughter, Mary (13), shares that love of sewing. Over the past several weeks, Mary has been enjoying Learn How to Make Doll Clothes Online Video Sewing Course from Rosie’s Doll Clothes Patterns. Here is our take on the course…..
Rosie is a stay-at-home mom who has been sewing since she was a young girl. As a mother, she began sewing doll clothes for her daughter. After a bit of frustration, she found tips and tricks that made sewing the clothes simple. Now Rosie shares the tricks of the trade with you via her online video course. Rosie’s Doll Clothes Sewing Course (intended for ages 8 and up) is over 130 online videos that walk you through everything you need to know to become a successful seamstress of adorable doll clothes. Rosie begins with the very basics of Setting Up Your Work Space, Cool Tools, Fabrics and more. As you progress through the videos, you will learn about Advanced Hems, Attaching Trims, Sewing Buttons and more. The videos are not overwhelming in length and information. For example the topic of How to Use Your Sewing Tools, it is broken down into thirteen videos. With each video about 5 – 10 minutes in length, it is perfect for digesting information and being able to apply it later. It also allows for ease in referring back to various aspects that you may need a reminder or refreshment on. While the videos do share a plethora of information, Rosie does an excellent job of teaching and instructing you through various sewing techniques and patterns. She is engaging, understandable and (a favorite of my daughter’s) she has a lovely accent. You or your child would have no problem learning and excelling with this video series. 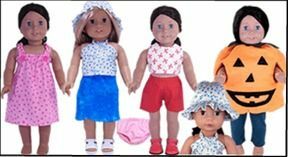 To make Rosie’s Doll Clothes Online Sewing Class even easier to implement, you receive 8 American Girl/18″ doll patterns free to jump right into sewing. The patterns include: crop top, shorts, nightgown and more. In no time you will have a fun, adorable wardrobe for all the dolls in your home! Purchasing the Online Video Sewing Course gives you access to over 130 online videos for one year. With this purchase you also receive the eight free patterns. The one year online access allows you to learn at your own pace and viewing videos as often as needed. Due to exchange rates, the US pricing can vary. The current US pricing is $47.46 but may fluctuate a few dollars in either direction. 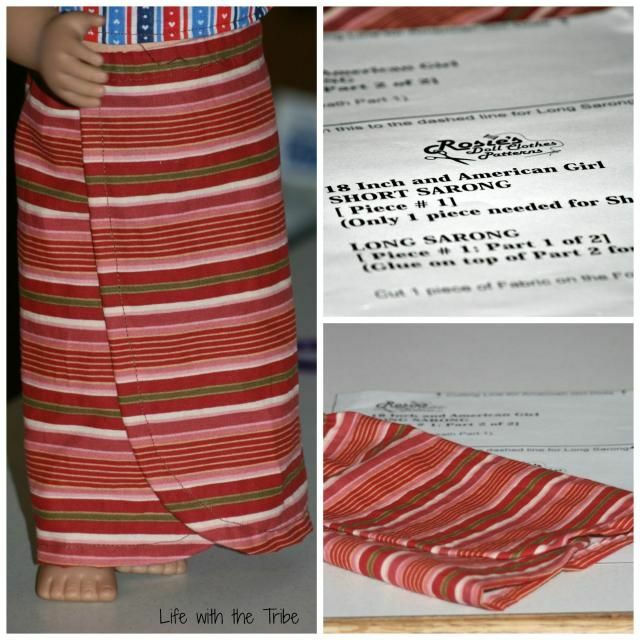 Purchasing is quick and easy at Rosie’s Doll Clothes Patterns. My daughter, Mary, was the main user of this course. Mary came to this course with sewing experience and knowledge. She has not had any formal instruction but has learned mainly by “jumping in there and sewing”. I have answered questions for her as they come up. Doll clothing was an area she was eager to learn about so was thrilled to give this program a try. Since Mary is older (13) and had previous experience, I let her use this course independently. Mary worked at a steady pace and had no problems understanding and implementing what she learned on the videos. Very quickly she was able to whip up doll clothes that were very simple to construct and could very easily be fancied up. I will definitely be using this course with two of my other daughters; Lydia, 10 and Hannah, soon to be 8. We will have a joint class with them and take it at a much slower pace than Mary used. Even though this course is designed to teach you to sew doll clothing, the skills learned through this course can easily be transferred to child or adult clothing. 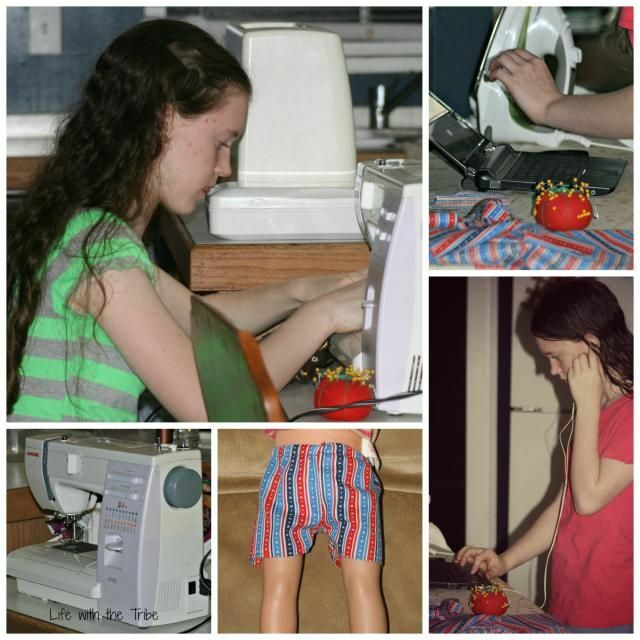 It would be the perfect gift or homeschool elective for your child who wants to learn to sew! 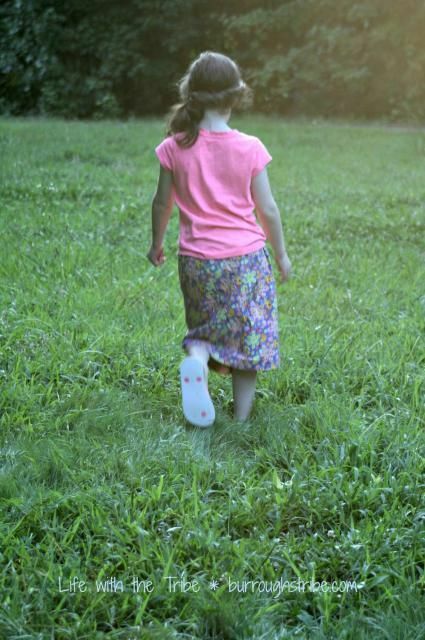 Take a moment and head over to Rosie’s Doll Clothes Patterns and look around. You can also swing by the Crew and see what others are saying about Learn How to Sew Doll Clothes Online Sewing Course. Several years ago we used milk crates to help organize the children’s schoolbooks. The milk crates worked well for a bit but not long term. All depending on how the house was flowing, the crates have been used by just about everyone in the house. Most recently they were once again holding books: library books and review items so that nothing would get misplaced or lost. Guess what? They were replaced again by a small bookcase. What to do with those milk crates? I really needed to use them for toy storage. 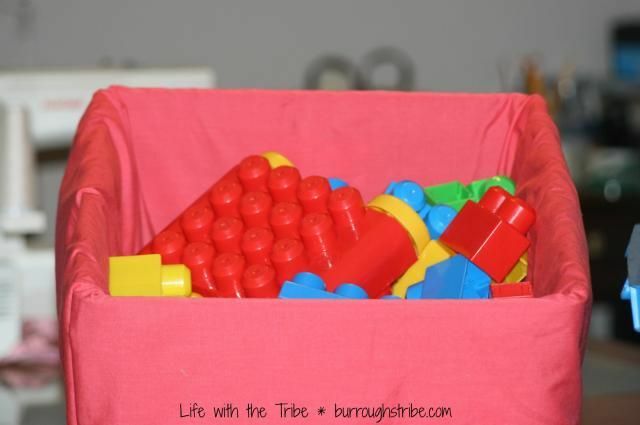 Items such as: Little People, Duplos and play food really needed a new home. Unfortunately, all those items fall right through the openings in the milk crate. Yeah, not really working for me. 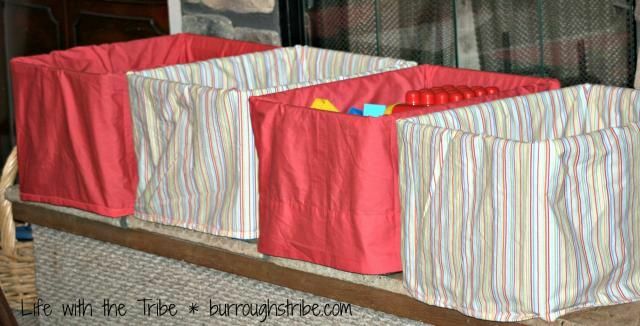 A moment or two on Pinterest and I found a simple, quick tutorial from Karen at Sew Many Ways that helped me whip up some milk crate liners. I grabbed some sheets I purchased on clearance to use and went to work on the sewing machine. A couple of hours later, I had five cute and functional liners. Simple? Yes. Quick? Yes. Functional? Yes. Cute? I’m going with yes. The crates really are the perfect solution for the toy storage. The size contains the toys with no overflow. They also fit beautifully on the fireplace (we don’t use it) and don’t look out of place. 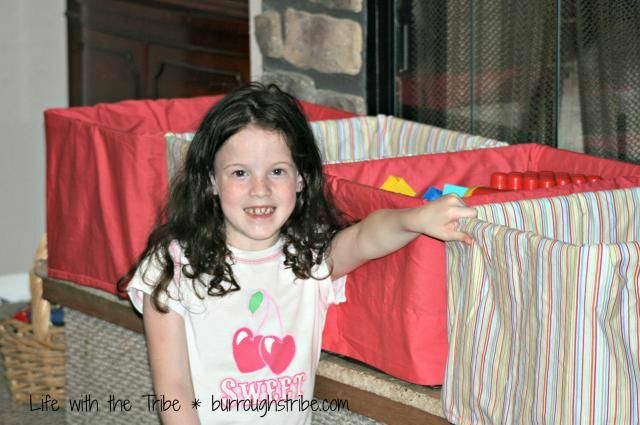 Another advantage is that it is easy for the little ones to grab a crate and sit and play. Easy to get out means that it is easy to clean up. Speaking of cleaning up…liners get a bit dirty? No problem. I can easily toss and wash them up. Perfect for having little ones running around. I have a few more containers and baskets that I might need to whip up liners for soon. I am loving having a bit of color in my life. Have you been crafting or decorating lately? I’d love to see it! It seems as if the day goes by and I realize that I didn’t even attempt to cross off an item on my “To Sew” list. Sewing means retrieving and hunting down all the necessary items. It never fails when I need to sew that I can’t find the measuring tape, the seam ripper or thread I need. Add in that the dining room/school table is my sewing spot adds in an extra twist of fun. Several days ago, I decided that no matter what else was pressing that day, that I was going to sew! I found a fun, colorful fabric and measured Hannah. She needed something new and fun, right? It was a simple skirt. A yoke waist with elastic and a simple gathered skirt attached. It just took a small bit of my afternoon. It was a perfect fit. Alas, she had to wait to wear it. Amazingly, the child had not one shirt that would match. How does a seven year old girl not have a shirt of white, pink or yellow? A problem quickly solved on the next errand day. I couldn’t resist snapping a picture or two. It was a humid, hazy summer afternoon in the south. The grass was high and the mosquitoes were hungry. We didn’t linger long. I do love how the pictures turned out. 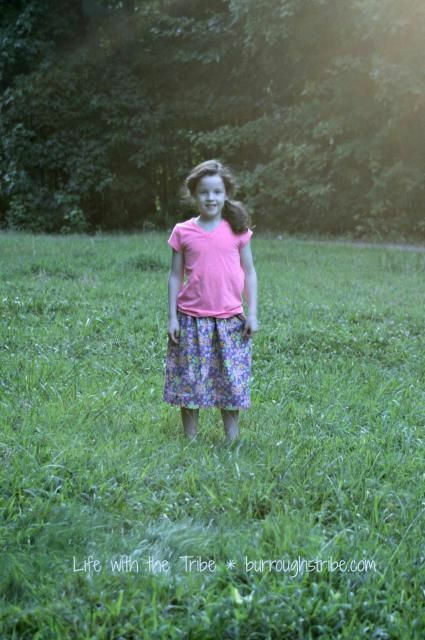 I think I need to make her another skirt or two.